Magnolias (Magnolia spp.) are widely admired as flowering shade trees. Some magnolia species are deciduous and lose their leaves. Others are evergreen and do not. Another magnolia distinction is that some species have wide, saucer-shaped blossoms while others have blossoms in the shape of a star. 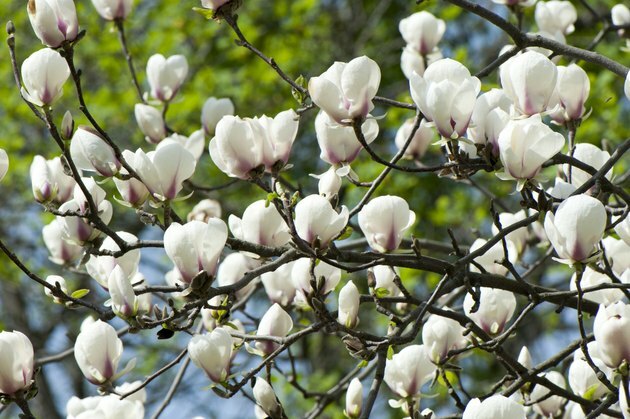 There are both native magnolias and species that originated in Asia. The white blossoms of a magnolia tree. There about 120 species of magnolias worldwide, with eight in North America, of which six are deciduous. Deciduous magnolias are the most cold hardy. Evergreens typically require warmer climates. New hybrid magnolia cultivars appear every year. Cultivars in the form of shrubs yield the showy, fragrant blossoms for which magnolia trees are famous. 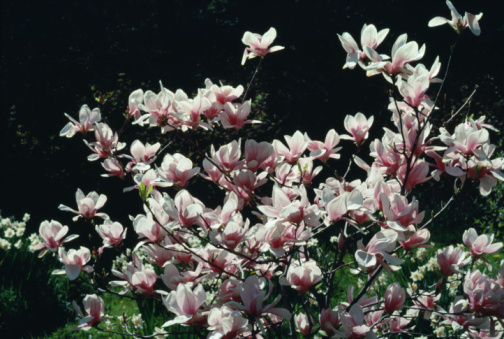 Saucer magnolia (Magnolia x soulangeana) is famous for its saucer-shaped, 3- to 6-inch-wide, pink to purple flowers. Some cultivars are shrubs while the trees grow from 40 to 70 feet tall in U.S. Department of Agriculture plant hardiness zones 4 through 9. A native of North America, bigleaf magnolia (Magnolia macrophylla) is noted for its oblong leaves that grow to 30 inches long. It grows from 30 to 40 feet tall yielding 8- to 10-inch-wide white flowers that have rose-purple bases. Bigleaf magnolias grow in USDA zones 5a through 9b. Sprenger magnolia (Magnolia sprengeri) grows up to 40 feet tall and 30 feet wide with a low, spreading canopy. It yields showy pink or white flowers in spring, and its leaves are bronze or gold when they drop in the fall. Sprenger magnolia will grow in USDA zones 7 through 10. Native to Asia, star magnolia (Magnolia stellata) grows 15 to 20 feet tall, yielding star-shaped white flowers in late winter to early spring. It is sometimes grown as a rounded or oval shrub. Star magnolias will grow in USDA zones 4 through 8. Perhaps the most well known magnolia, the southern magnolia (Magnolia grandifolia), famous for its large, showy white blossoms, grows from 60 to 80 feet tall with a spread of 30 to 50 feet. Southern magnolias will grow in USDA zones 7 through 9. Noted for its extremely fragrant yellow to yellow orange flowers, Champaca magnolia (Magnolia champaca) is a slow-growing evergreen native to tropical and subtropical Asia. It grows from 25 to 30 feet high in USDA zones 10a through 11. Cucumber magnolia (Magnolia acuminate), a deciduous native tree, is especially cold hardy, growing in USDA zones 2a through 8a, although it does not tolerate urban pollutants. It grows from 40 to 70 feet tall, yielding yellowish-green, tulip-shaped flowers. Its leaves turn gold when they drop in autumn. While the native sweet bay magnolia (Magnolia virginiana) will grow in USDA zones 5 through 10, it is deciduous in the colder part of that range and evergreen at the warmer end. It is grown as a shrub or as a tree from 15 to 20 feet tall in colder parts of its range and up to 60 feet tall in the southern, warmer parts. How Big Do Redbud Trees Get?